HCM CITY (VNS) — Primatologists have identified the 25 most endangered primates globally, of which three are endemic to Viet Nam, according to a press release from the Fauna & Flora International (FFI)- Viet Nam Programme. 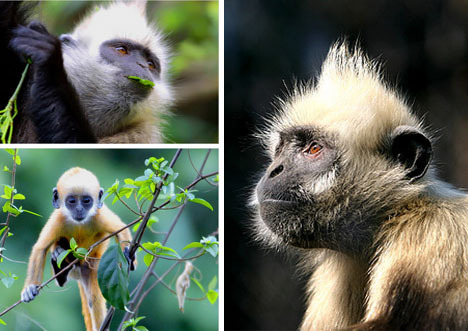 The Cat Ba langur (Trachypithecus poliocephalus), Delacour's langur (Trachypithecus delacouri) and Tonkin snub-nosed monkey (Rhinopithecus avunculus) are the three Vietnamese species to figure in the emergency action list: the 2014-2016 World's Top 25 Most Endangered Primates list. The Cat Ba langur was reported to have less than 70 individuals now while the numbers of the other two species dropped to below 200. Eleven species that occur in Viet Nam are listed as critically endangered, up from seven in the 2008 list. "These updated assessments continue to highlight the importance of Viet Nam as a centre of primate importance globally," Dr Ben Rawson, FFI-Viet Nam Programme Country Director and IUCN SSC Co-Vice Chair for SSE Asia Region, said. "They also highlight that Viet Nam is at risk of being the first country to lose a primate species to extinction." No primate extinctions have been recorded in the 20th or 21st centuries. Le Khac Quyet, a leading Vietnamese primatologist, said, "We need more actions to conserve Viet Nam's endangered primates and their habitats by improving population protection, afforestation, law enforcement and conservation biological studies as well as involvement of local people in wildlife conservation." FFI's work spans the globe, with over 140 projects in over 40 countries, mostly in the developing world. The FFI Viet Nam Programme focuses on the conservation of Viet Nam's most threatened wildlife and important habitats and eco-systems. A particular focus of the programme has been primate conservation activities that span more than 15 years and have resulted in the discovery and protection of some of the world's rarest primate species. FFI-Viet Nam programme are currently working on the conservation of five of these species: The Cat Ba langur, the Tonkin sub-nosed monkey, the Cao Vit gibbon, the grey-shanked douc, and the western black-crested gibbon.